Today was a full day around Galilee and the Golan Heights. Mass at the Mount of Beatitudes was a great start for the day. Having reverent priests and a holy deacon is a blessing for all. 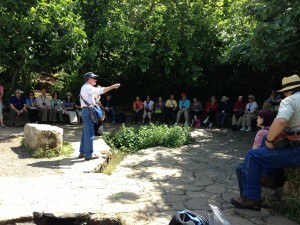 The priests gave their vocation stories on the way to Caesarea Philippi. Especially gripping was the story Fr. Janusz who was raised in Poland under Communist rule. Fr. Mark’s late vocation story was also moving and kept everyone wide awake. 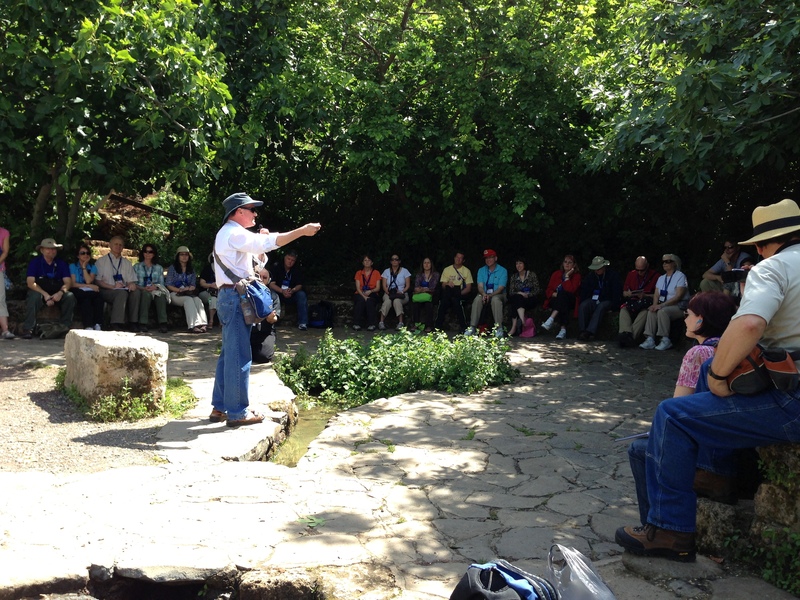 At Caesarea Philippi I gave my talk “Peter: the Rock, the Keys and the Chair.” We all climbed around on the rock. After which we went to our favorite Druze Restaurant for Druze Bread sandwiches and looked out over Lebanon and Syria. We discussed the recent silence of our government and the secular media about the problem with Islam and the jihadists. A visit to the place Jesus multiplied loaves (yes, it was a miracle) and the place where Jesus appointed Peter to be the shepherd of his sheep. I gave my 1/2 talk on John chapter 2. Lastly we have a gourmet dinner at our favorite restaurant in Israel – Auberge Shulamit. The smoke salmon, smoked goose breast, beef steak, smoke lamb ribs and more is always praised along with the finest wines in Israel. On the way home we turn the bus into a comedy club with everyone sharing their favorite jokes.